Believe it or not, the vinyl edition of Paul McCartney's LP, "Off The Ground" sells for a lot of money these days. Why? Because when this album was released in February 1993, most people had converted to the CD format, so the vinyl albums sales were in steady decline, and this album simply didn't sell. It was probably not pressed in too many copies either. Now that CD is turning into an abandoned format, people are buying vinyl again, and this is a rare album, vinylwise. 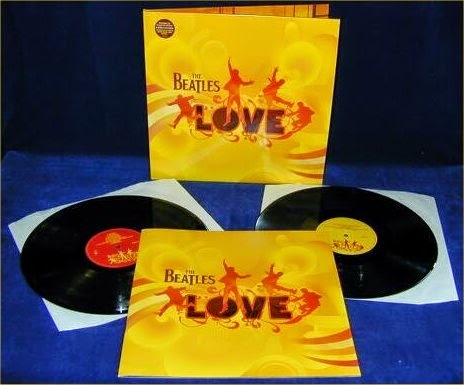 At the time of writing this, only three copies of the UK pressing are for sale on ebay, a used one from a UK seller, priced at GBP 98.99, one from a US based seller at US $160.00, and finally a still sealed UK pressing from a seller in the Russian Federation, priced at US $399.00 or best offer. Then there's a Korean pressing in poor condition, but the seller is asking $99.99! Apart from those, three Spanish pressings of the album are on ebay, asking prices are EUR 19.95, US $49.75 and US $99.75. Having made the switch to CDs myself, nonetheless I still did buy vinyl albums, and "Off The Ground" is one of the ones I bought. And then I came across a 2CD version of "Off The Ground", called "Off The Ground - The Complete Works". I bought it, of course. It's almost like a deluxe version of the album, and I believe it was only released this way in Japan, Germany and perhaps Holland. Of course, the single "Hope of Deliverance" from this album turned out to be probably Paul's final hit single, and it charted mainly in Europe. It went to number 83 in the USA, no. 18 in the UK singles charts, no. 3 in Germany, no. 1 in Spain and number one for a week on a general European chart. Here in Norway it peaked at no. 4. "Off The Ground - The Complete Works" can also be found on ebay these days, priced from EUR 69.99 and up. 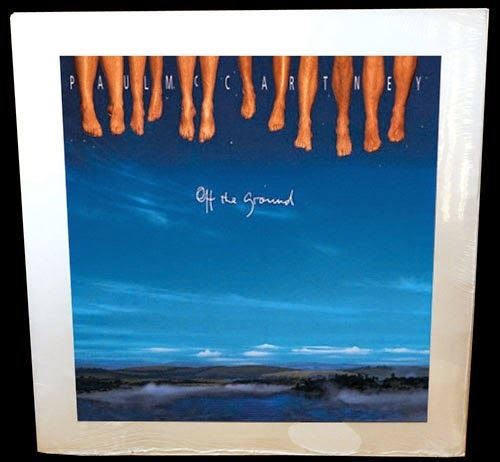 Off The Ground as a regular CD was rereleased on CD in January 2014 on Hear Music, now also featuring a digital download card for those who want the audio files available to them. The Beatles is, of course, history. But when I grew up and started to assemble my Beatles collection, it was also geography. 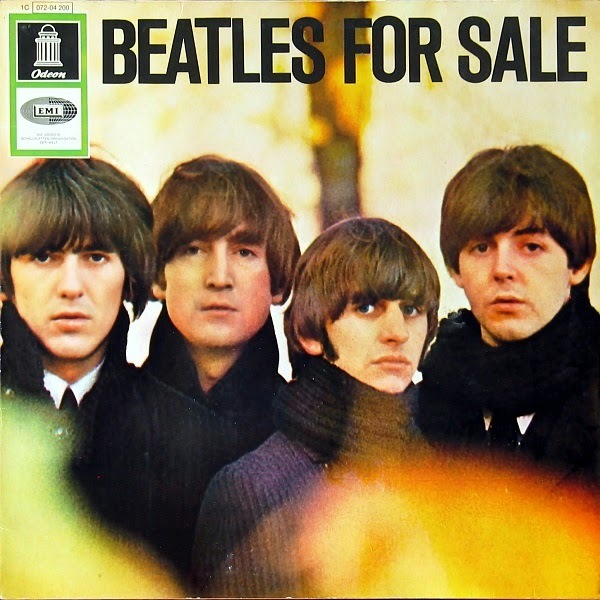 In the late seventies I started collecting Beatles and solo-Beatles records. Since I was in my home country, Norway - you might be forgiven to think that the records I collected were pressed and printed in Norway. Not so. EMI in Norway had ceased to print their own records for the domestic market, and relied on imports. Most of these were from Sweden, since EMI for a while kept up producing records there, but after a while they closed that pressing plant. So EMI Norway started importing records from Holland. Meanwhile, the Polygram distribution company was still printing records in Norway, so for some Ringo, George and John titles, Norwegian pressings were available. Those were albums like "Ringo the 4th", "Somewhere in England" and "Double Fantasy". There was even a "McCartney II" record with a sleeve printed in Norway, if I remember correctly. The record inside, however, was imported from Sweden. Even if I had been staring to collect records back in the sixties, my collection would have been a mix of domestic and foreign pressings. "A Hard Day's Night" was the first album pressed in Norway. Prior to that, I would have had to buy Swedish, Danish or UK imports of "Please Please Me" and "With The Beatles". 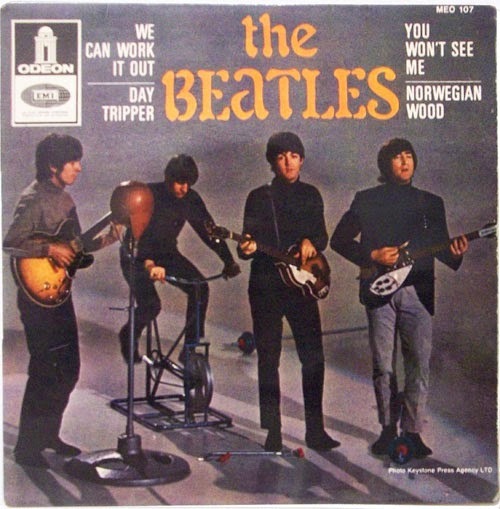 Even when they did start printing and pressing Beatles albums in Norway, they didn't do that with all of them. "A Collection of Beatles Oldies" would have been a foreign pressing, as would "Magical Mystery Tour", "The Beatles" and "Yellow Submarine". As for EP's, only three of those were domestic pressings, the rest of the EPs found in record shops were from Sweden or the UK. Now singles was one thing we did press in Norway, and in abundance. I believe there were 34 different Beatles singles released here, all pressed domestically and with individual picture sleeves. But that only lasted up until around 1975. "Mrs Vandebilt" / "Mamunia" was the final domestically pressed single from EMI, from then on they imported singles from Sweden, and after that, from the Netherlands. The most sought after singles were from the UK, because their covers were more cardboardy than their Dutch or Swedish counterparts. Even the albums had a stiffer cardboard than those flimsy Swedish sleeves. But UK imports were few and far between, in most cases you'd have to go to the UK to find them. I was able to complete my Beatles album collection, but the albums were mainly from Sweden. When it came to solo albums, that was a completely different story altogether. 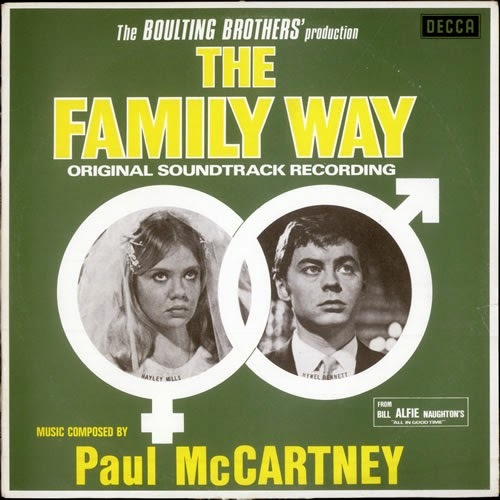 Did you know that in the late seventies, Paul McCartney's (arguably) first album, "The Family Way" was all out of print everywhere, except for in one country in the world? That's right. If you told your local record shop to get you that album, they would get it - from Australia. So that's the reason why many of us fans in their fifties will have the Australian "Family Way" in their collections. The same went for George Harrison's album "Wonderwall Music". Out of print in every single country in the world, except Germany. So we all have the German edition of that album. John and Yoko's experimental albums, "Life With The Lions" and "Wedding Album" were only kept in print in Japan, and the same applied to George's "Electronic Sound". Although USA pressings of that album wasn't uncommon to find. Fortunately, one of my mother's tenants, a woman who was a few years older than me, had the original UK pressing of "Life with the Lions". I swapped it for my newly acquired Japanese reissue. She didn't care about which country her records came from. "Two Virgins"? Forget it. That one wasn't kept in print anywhere, except for with the counterfeiters. My generation all have counterfeits of that album. But those were the tricky ones. And often they were the final ones you had to get, and only to have a complete collection. You wouldn't actually play them, not more than once, anyway. Except perhaps "The Family Way". One album I was lucky to find in the bargain bin was "Holly Days", a Wings album in all but name. Not to mention "Thrillington", another lucky find. Most people didn't have those. But the rest were easy peasy, mainly Swedish pressing, a few German ones, some USA ones and only the lucky would find a few UK pressings. As my collection grew and I had them all in stereo, I had to get the Beatles albums again, now in mono. A few trips to London later, I had most - and completed the collection when the mono albums were rereleased in 1982. With the UK album collection completed, my next task was to et a full collection of the USA albums. And. like an answer to my prayer, a record shop in Oslo started to import the cheaper Canadian albums. So I got those, including those early Canadian only releases. In 1984, I bought my first CD player (thanks to Paul McCartney releasing a CD of Give My Regards To Broad Street with an extra song that was neither on the LP, nor on the cassette), and that resulted in having to get the collection again - this time in that new format. And for some strange reason, I again had to get my collection together from different countries. 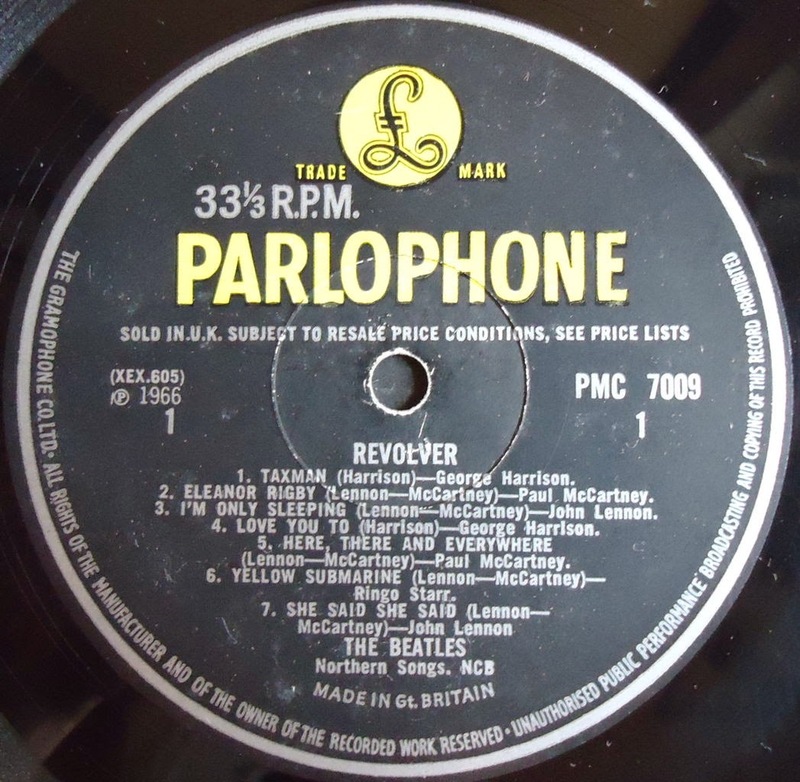 The solo Beatles albums were released on CD, but some in USA pressings only, and some from the UK. And not the same titles, so you had to cross shop to get them all. And then of course, you had to get both the UK and USA pressing of McCartney's "All the best" because of the different track lists. And you had to get the USA "Band on the run" for "Helen Wheels". Italy has some of the nicest looking Beatles singles covers anywhere. Along the way, you'd come across foreign records with nice picture sleeves, and you'd pick up those if you could afford them. The French EPs suddenly appeared at a used records shop in Oslo. I wanted them all, but could only afford one. And the next day, they were all gone. 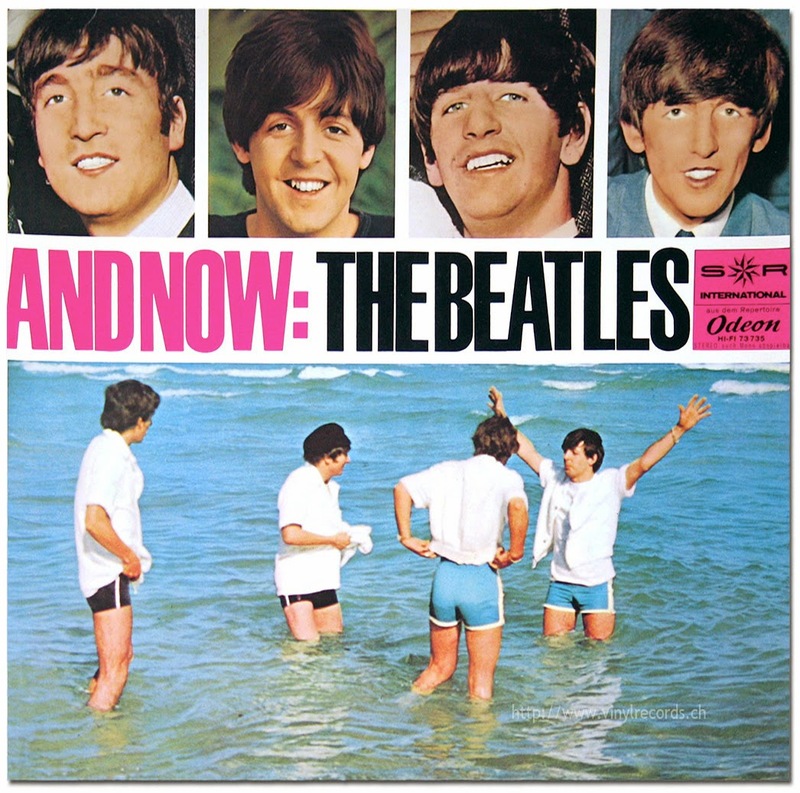 Now and then, German albums would be available in some shops. And you'd pick them up if you had the money there and then. And everyone was always bragging about how much better the vinyl on the Japanese pressings was, so you'd sample a few of them, as well. 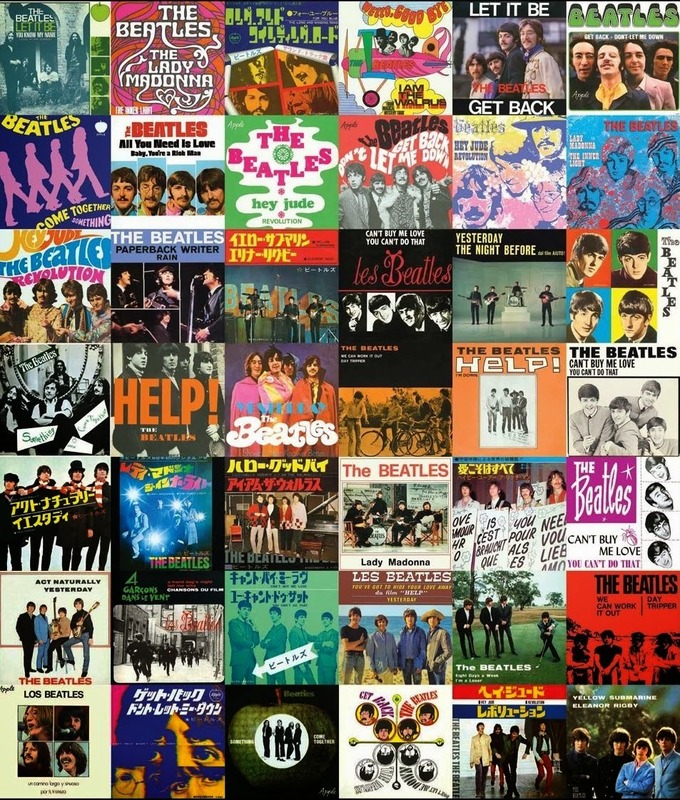 Beatles singles from all over the world. 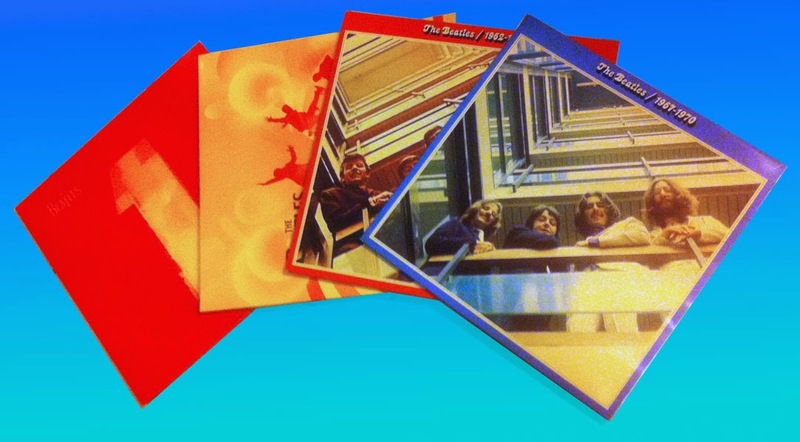 Along comes ebay, and now you have a smorgasbord of Beatles releases from all over the world to choose from. 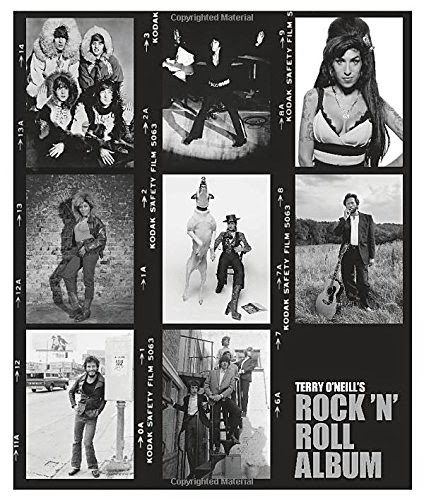 Terry O'Neill: 'The pictures are so naive. They didn’t know what to do either, but it was the beginning of everything. 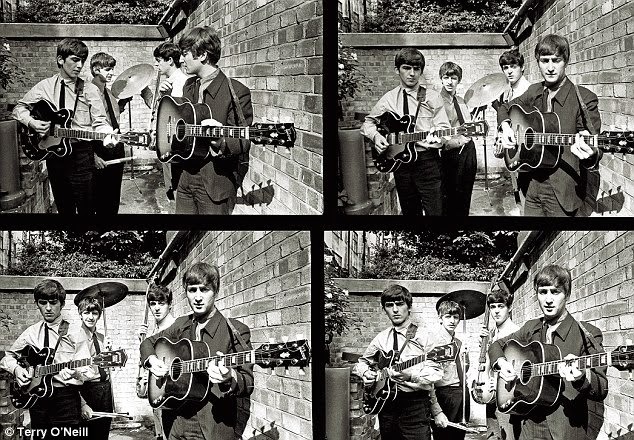 They were recording Please Please Me, and people didn’t know they’d be big". In 1963, young Cockney photographer Terry O’Neill snapped four unknowns from Liverpool as they took a break from a recording session at Abbey Road. The pictures were splashed across the front page of a national newspaper – and Beatlemania was born. Terry O'Neill: "1963. The very first pop picture I took, in the backyard at Abbey Road. I didn’t know what to do, nobody had photographed a group before so I just got them outside with their guitars, and Ringo with a cymbal. It was the only thing I could think of. The pictures are so naive. They didn’t know what to do either, but it was the beginning of everything. They were recording Please Please Me, and people didn’t know they’d be big. But they were four great personalities, it shone out of them. John was in charge, you can see that he’s the leader from the picture, he was definitely the stronger force. He wanted to be at the front. John and Paul were a great double act, not just on stage. Off stage they were clever young hustlers. John had the irony, Paul the charm. They were nobody’s fools. George was a brilliant musician, but shy and serious. Ringo was new to the band and was a very funny guy. An editor had asked me to photograph the emerging youth culture. They just seemed to sum up the changing mood of the times. They had hair that was long for the day, and their clothes were smart, but relaxed, almost casual. I took the pictures back to the paper. They sat in the editor’s in-tray but one day there were no train crashes or wars or sensational trials to put on the front page, so he put The Beatles on it – and there was this amazing response. The newspaper sold out. It was a revelation – young people bought the paper because a young unknown band was on the front page. A few weeks later the record was released and it went straight to No 1. In weeks, they were the biggest news in Britain; in months the biggest news in the world – and the Sixties took off". Dennis Elsas: "John Lennon was my "surprise" on-air guest on September 28th, 1974, 40 years ago this weekend. What began simply as an opportunity for John to promote his just-released Walls and Bridges album turned into two hours of radio magic: John as the DJ, John discussing his former bandmates and speculating on the possibility of a Beatles reunion, John sharing some of the secrets behind the songs, and John just being John. These are some of my favorite moments from that unforgettable day". "Love" and other albums scheduled for rerelease. "Love", "1", "1962-1966" and "1967-1970". Due out in November for the Christmas market, the exact date(s) are still not known. 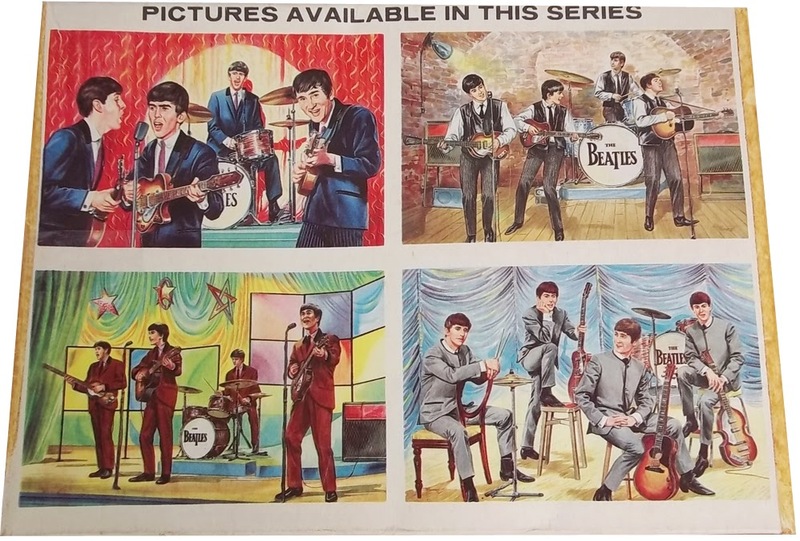 Of course, among these, "1" is a beauty with both inner sleeves and a big poster depicting Beatles singles from around the world. Still no word of an accompanying "1" music video collection, though. And now with the other relaunched albums, they needn't confine to the "1" theme, either. Here they are again: The old new vinyl albums. 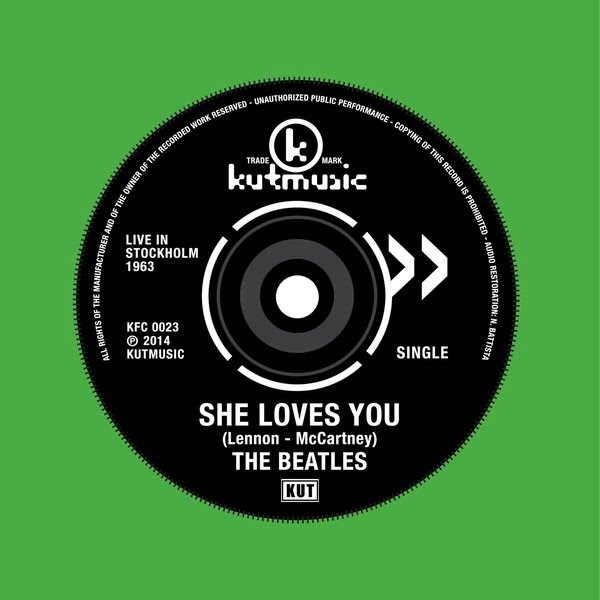 A week ago, we told you about a new live single from the Beatles, released on a small Italian label. 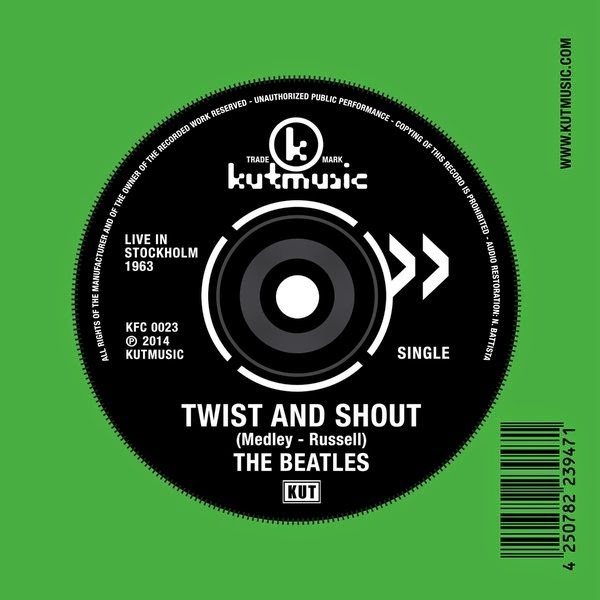 The release was made possible because The Beatles Bootleg Recordings 1963 fell a bit short to secure The Beatles EU copyright on two songs from the 1963 radio concert in Sweden. Two of our readers, bri286 and Charles E. Moore then alerted us to this upcoming release, which seems to exploit that shortcoming further. We assume Call Me Back Again is a preview of the remastered Venus & Mars. Here's the iTunes page for the EP. For John Lennon there are a few clips from single songs taken from the Live Peace in Toronto 1969 concert, for George Harrison you'll mostly find music videos from the Traveling Wilburys, Ringo Starr has three or four music videos, and there's also a thin selection of clips from Paul McCartney, mainly three songs from the Prince’s Trust concert in 1986, along with the music videos for Queenie Eye and Nod Your Head. Now, with all the music videos produced by these guys throughout their careers, their video pages on iTunes could have had so much more to offer! Catering to the U.S.A. market. Sorry for taking so long between posts these days, but I'm currently busy putting together the new "Norwegian Wood" magazine, where I'm both editor, lay out designer and writer (most of the articles, anyway). 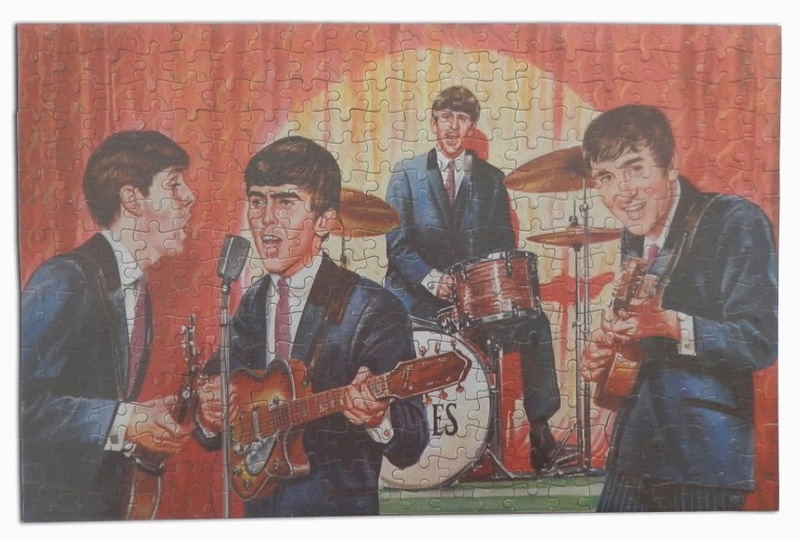 Also, the plans for the Norwegian Beatles festival have made me pretty occupied for a while. I'm so busy, I haven't even been to the record shop to look for George Harrison's Apple box. So as a service to those of you who are still holding out on that box, here's a promotional film they made for the new edition "Living In The Material World". Also, they've made one of the "Wonderwall Music" bonus tracks available to hear on the internet, it's the instrumental "The Inner Light". You can find that track over at Stereogum. 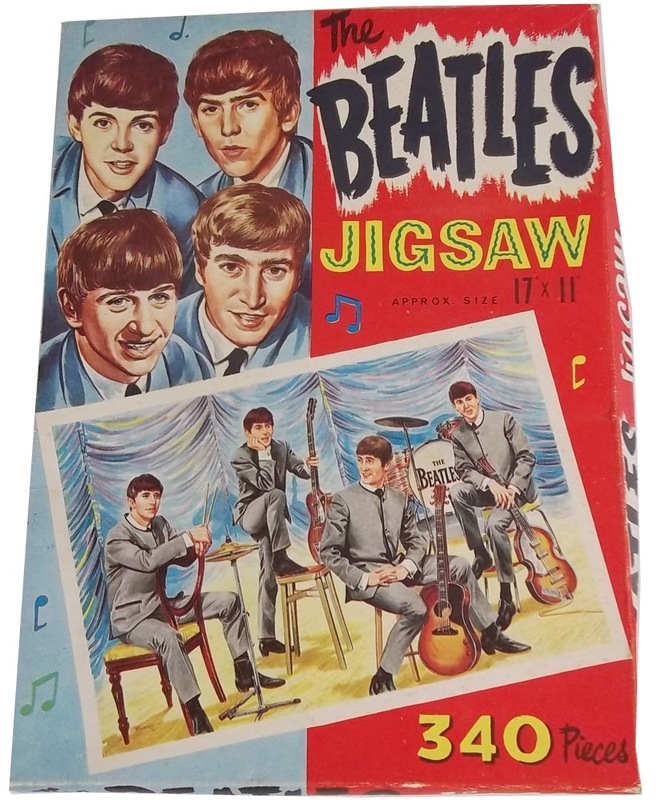 Jigsaw Puzzle Group (NEMS Enterprises, Ltd. 1963). This is no. 4. 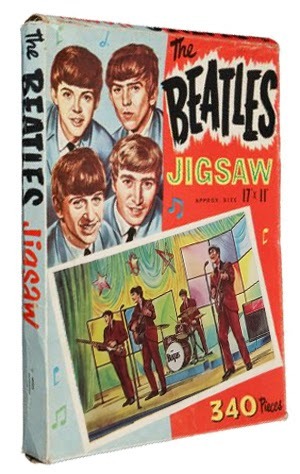 Looking for something special for a Beatle fan's birthday? 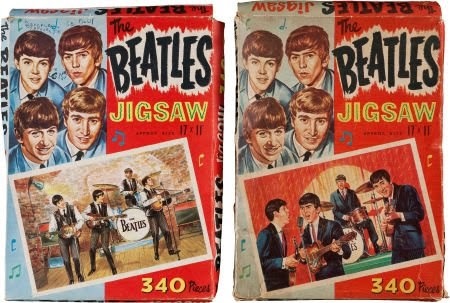 Forget about records, how about one of these original vintage 1963 jigsaw puzzles? They come in a variety of four. 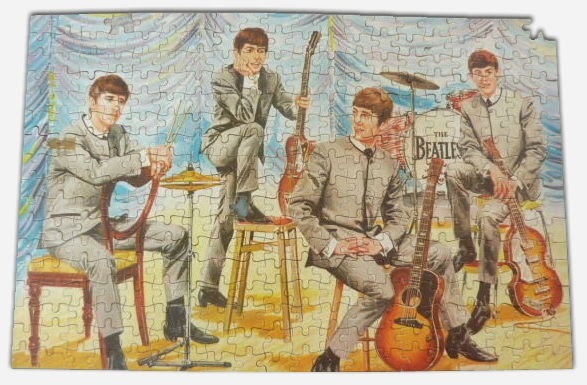 Easy to make, too - it's only 340 pieces! 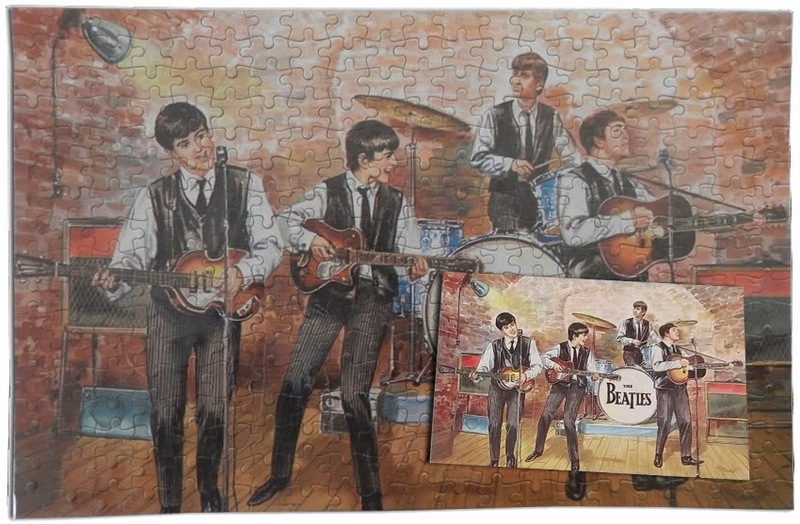 Each puzzle measures approximately 11" x 17" when assembled, and makes for a fine display when framed. The artwork is attributed to Walter Howarth. They may prove to be slightly expensive though, although more so in the USA than in the UK. Of course, if you should come across one, make sure to count the pieces. Otherwise, your friend may be in for another surprise after having (near) completed it. No. 2 and No. 1. Of course, if your friend is a completist, by presenting him with one of these you'll be sending him on a quest for the other three versions to complete his collection. And if he's a googler, his quest will at one point or other land him here on this page. There's also supposed to be a picture card in the box, showing the complete picture. This may be harder to come by, as it may have ended up in a scrap book at the time. It's not in your box? Sorry I ruined your day. We told you before, and now it's official: There will be yet another edition of Paul McCartney's album "New" from October 2013, the release date is October 28th, 2014. This will feature a hardbound cover, which will hold 2 CDs and 1 DVD, and it's called "Collector's Edition". As excited as we are of getting two new songs, we have to admit that as long standing fans, we are getting a bit tired of this constant repackaging of music that we have already bought. 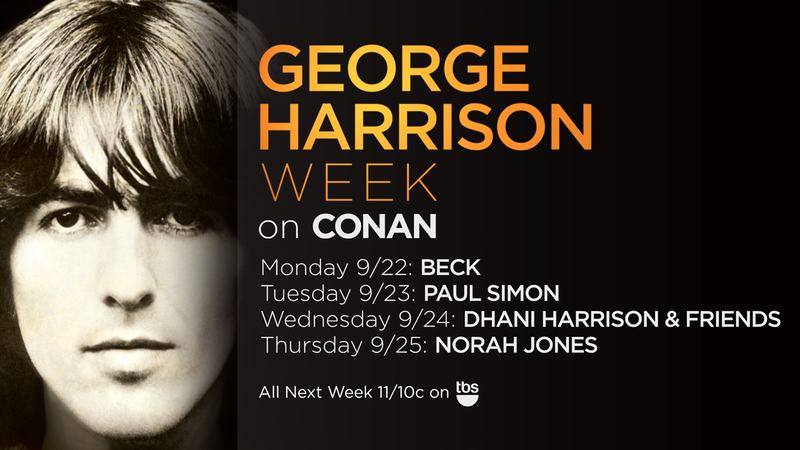 The promotion campaign for the new George Harrison release "The Apple Years 1968-75" is kicking into high gear, with a week of celebrations coming up on "Conan" and the upcoming Georgefest in Los Angeles. And they are also using the bonus tracks for what they're worth. A version of This Guitar (Can't Keep From Crying) popped up on last week on npr.org, now a version of "Dark Horse" appeared on RollingStone.com. And it turns out to be an early take that hasn't been heard before, even on bootlegs. So head on over and take a listen! A latter day incarnation of the bootleg DVD "Chronology"
We must admit that we are starting to lose faith in the previously leaked news about a release of a Beatles promo video collection for October, themed to the "1" album. The Dutch Beatles promo special last month was to us an indication that perhaps they were gearing up for a DVD, but October keeps creeping up on us and no word from Apple. Word was, the "1" promo DVD was going to come out alongside a new vinyl edition of the album, as well as promotion of the Avedon posters. 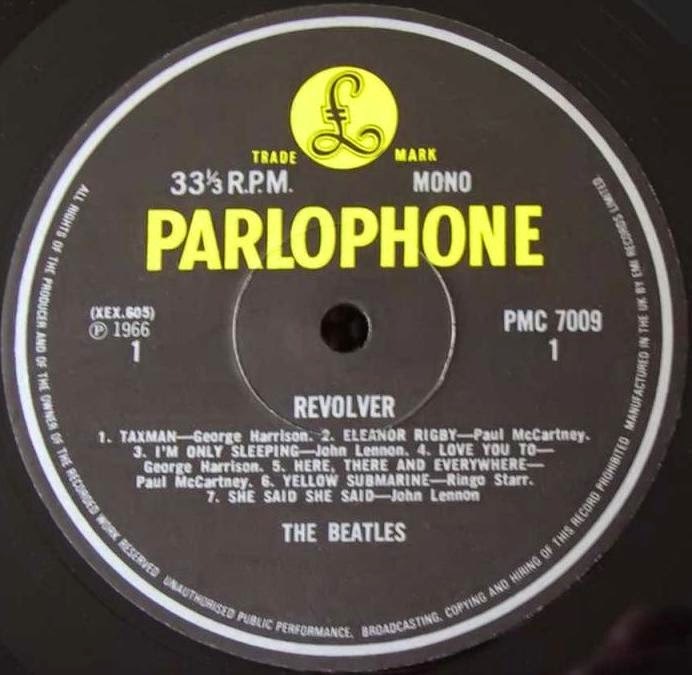 The "1" vinyl reissue did actually appear on the last release plan from Universal Music, but the date was still pending. Perhaps it is being pushed further towards the Christmas market? And where does that leave "Bootleg Recordings 1964"? 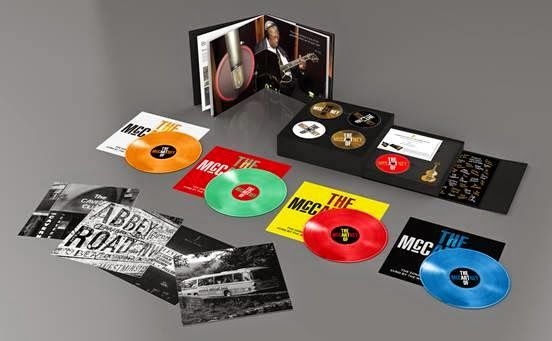 We have seen a lot of official product from the Beatles camp this year, starting with the release of the USA albums on CD, the Blu-ray/DVD of the restored and remastered "A Hard Day's Night" film, the 5 CD Japanese boxed set and now the mono vinyl boxed set (also available individually), but all of these have been re-releases of stuff that's already out there, even though it has been sonically updated. What we fans would really like to see is something that hasn't already been sold to us many times over already. A promo video collection would fit that bill very nicely. It has never been available commercially, even in the video cassette era, and the manufacturers of bootleg DVDs have been reaping all the profit from this non-release since forever. So Apple, if you are reading this - know that we are ready for it and that it is something we all would purchase. The reissues you have given us so far this year have all been very expensive stuff, geared towards the money strong audience, whereas a DVD or Blu-ray of the promotional films would be something we could probably all afford. We found it on ebay. Note that there were made several versions or videos of certain songs, so no material on disc 2 duplicates what was on disc 1. Note that the Chronology DVD has been improved upon by later DVD compilations, notably the "Unsurpassed Promos" 4 discs set, divided into the 2 DVD "Tour Years" and the 2 DVD "Studio Years". I guess we can only dream that Apple should be as thorough as the Beatles fan bootleggers, and make such a comprehensive collection, but they should at least give us something. 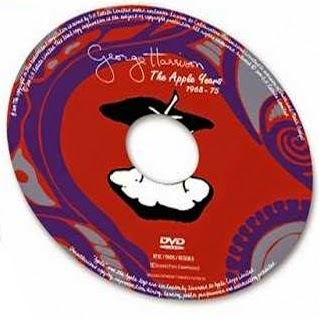 To celebrate the release of The Apple Years 1968-75 box set, Olivia & Dhani Harrison are giving filmmakers the opportunity to make a music video for George Harrison's song 'What Is Life'. Originally released in November 1970 the All Things Must Pass triple album, and later in February 1971 as the second single from that album, 'What is Life' was to become a top ten hit in many countries. It was also the B-side to ‘My Sweet Lord’ in the UK where it was the biggest selling single of 1971. 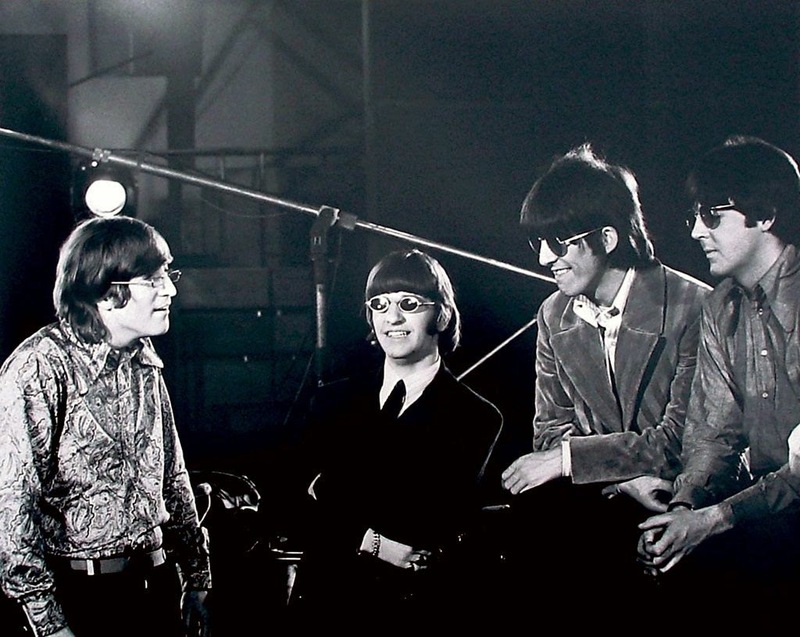 Written by George in 1969, he had originally intended it for Billy Preston, but the track was not actually to be recorded until the All Things Must Pass sessions in May 1970 when George was at Abbey Road studios with Phil Spector. Featuring musicians such as Eric Clapton, members of Badfinger, and the powerful brass section of Bobby Keys and Jim Price, 'What is Life' has become one of George’s most acclaimed songs. With no official video created at the time, this is a rare and exciting chance to create an official video for a globally loved and timeless recording! 5 finalists will be chosen by Universal Music & Genero.tv and will win a copy of The Apple Years box set. The ultimate winner will be selected by Dhani & Olivia Harrison from the final 5 and will win the $5k prize and be shared on the Official George Harrison website, Youtube channel & Facebook page. You may enter the competition through the Genero website. Deadline: October 21st. The trend of inviting fans to create videos for songs is a popular one, and has been employed earlier by both Paul McCartney and Ringo Starr. Ringo's updated version of "Wings" had a music video made by Jem Gerard, who won $3,000 for the winning video in 2012. In 2007, Paul McCartney invited fans to send in their own videos for the track "Nod Your Head", and a compilation of videos were made into an official video for the song. Since then, McCartney has compiled several other fan made videos for his new songs. There's a new book series on Apple Corps Ltd. coming up. Vol. 1: 1966-1968 is due out in the spring of 2015. It will have approximately 500 pages in full colour. Each book of this series will be limited to 500 copies only and each volume will come with a special collectable surprise! You can read more about the series and find sample pages over at AisforAppleBook.com. Vol. 1 of a is for apple tells the story of how Apple came together. It starts in late Summer 1966 with Lennon and McCartney's first solo projects, How I Won The War and The Family Way, running over to 1967 when the first multimedia corporation became reality with the foundation of Apple Publishing, Apple Retail and Apple Electronics and finally to 1968 when Apple Records topped the charts nearly everywhere. But even before the phenomenal success of Hey Jude and Those Were The Days Apple published some wonderful music on other labels such as Decca, RCA and Beacon. Many of the artists behind this wonderful records have never told their stories before. The book is authored by German Axel Korinth and Dutch Ed Dieckmann. They would also like to get in touch with people who worked for Apple, composed or play in a group signed (or nearly signed) to Apple Records and Apple Publishing, or people who have interesting stories to tell or rare documents, photographs and other stuff to share. You can get in touch with the authors through the website. A small Italian company - Kutmusic - seems to have taken advantage of the loophole in EU copyright legislation to release two songs from the famous Swedish radio concert in 1963. Heralded as possibly the best live recording of the Beatles ever, this concert was exploited for The Beatles' Anthology in 1995 - but only five of the songs from the concert appeared on that album. 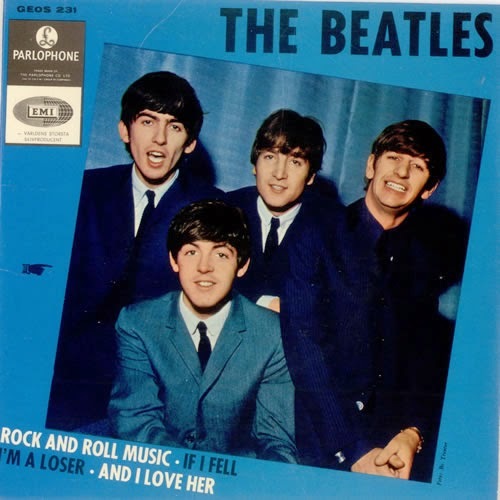 The remaining two, "She Loves You" and "Twist And Shout" are presented on this CD single. The radio programme was called "Popgrupp från Liverpool på besök i Stockholm" ("Pop group from Liverpool visits Stockholm"), and has been broadcast several times on Swedish radio, starting in 1963. The last broadcast was in October 2013, duly reported in this blog. 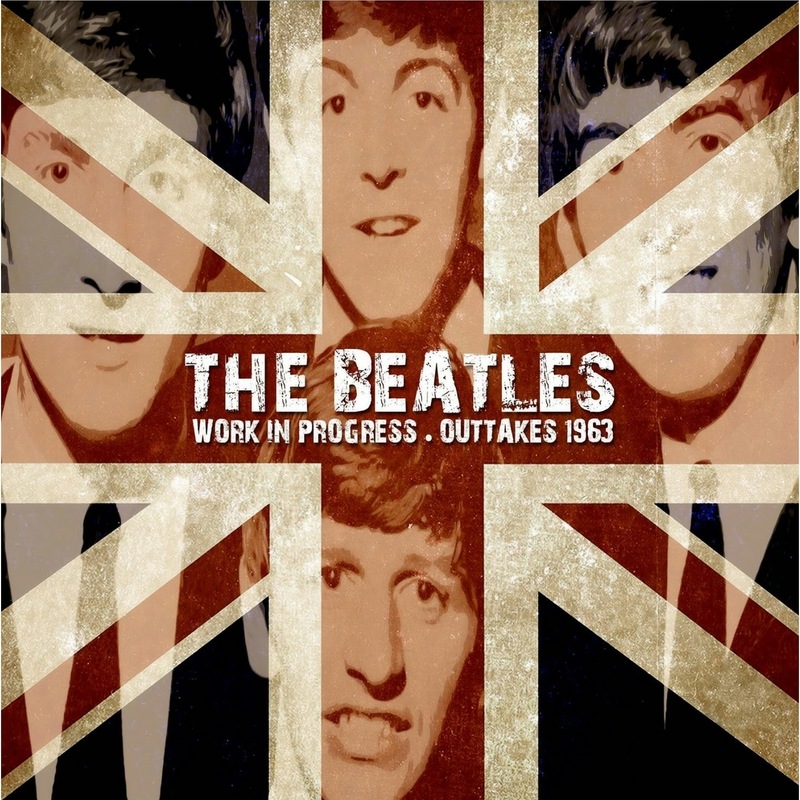 When the official "Bootleg Recordings 1963" was released for Christmas 2013 on iTunes, we gathered that the release was intended to close that copyright loophole, but it fell a bit short to do just that. 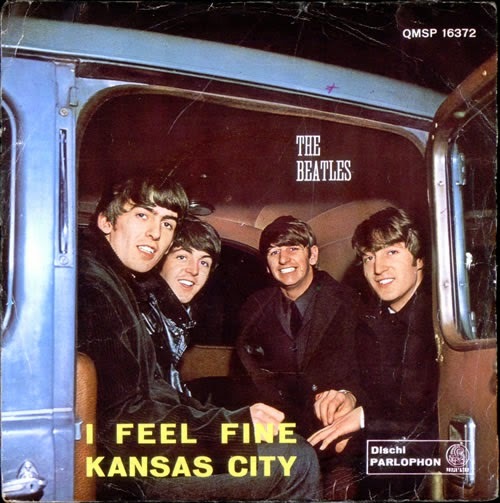 There were other 1963 recordings in circulation among fans and collectors that weren't part of that release. These we listed in a blog post from December 18, and the two tracks presented here were on that list. The CD sleeve mimics the seventies "green series" of singles, and lists Hans Westman as the (original) engineer of the recording, and Nicola Battista as the engineer responsible for audio restoration. It has been speculated that the great quality of this performance by the Beatles was mainly because their Vox amplifiers hadn't been delivered to Sweden yet, so they had to make use of the Fender amplifiers that were available in the studio. The Beatles were under contract to use Vox amplifiers only, but they figured they could get away with not using them this time, since they were only heard and not seen - apart from by the radio studio audience. This, combined with a good recording studio and an enthusiastic audience made for a superb performance, resulting in a great live record of the Beatles in 1963. This single is listed over at Discogs. Here is the new Paul McCartney song called "The Hope Song". The music of “Destiny” was a collaborative effort between Bungie's former in-house composer Marty O'Donnell, his partner Mike Salvatori and former Beatle, Sir Paul McCartney. The New York Times reports that one of McCartney's contributions to the game's soundtrack, "The Hope Song" will be released as a single. The Times calls McCartney's track the game's theme song, reporting that it is fully orchestrated and was recorded at Abbey Road Studios under the direction of Giles Martin, son of The Beatles producer Sir George Martin. The song's producer is Mark "Spike" Stent, who has experience recording a handful of James Bond movie theme songs: Tina Turner's "GoldenEye" and Madonna's "Die Another Day." McCartney announced his involvement in the Destiny score in 2012, tweeting, "I'm really excited to be working on writing music with @bungie, the studio that made Halo." O'Donnell detailed his collaboration with McCartney last year when Bungie unveiled the first details on Destiny. He said the former Beatle was drawn to the project by his interest in the technology behind interactive music. "He didn't only want to do Paul McCartney music," O'Donnell said. "He wants to get involved in themes, how melodies and motives can be a touch point for people." Paul McCartney is also credited as co-composer of the incidental music piece "Music of the Spheres", alongside Martin O'Donnell and Michael Salvatori. Colourisation tests by our old friend, HIWAX. After months of suspension, a website for the "Art of McCartney" project was launched today. And yes, Dylan is confirmed to do "Things We Said Today"! 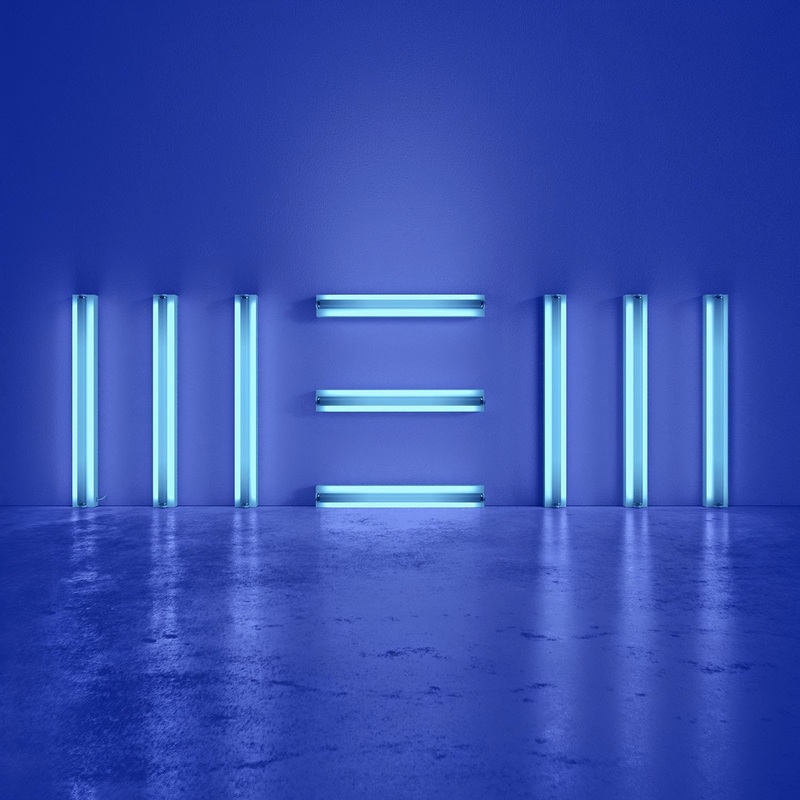 September 9, 2014 – New York – The Art Of McCartney is a long awaited and very special project celebrating one of the most universally acclaimed songwriters of all time, Sir Paul McCartney. 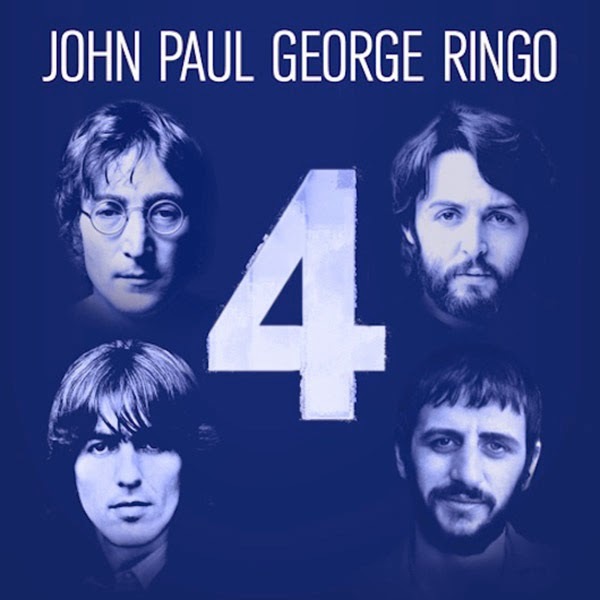 With backing provided by McCartney’s long time band, classic tracks such as Maybe I’m Amazed, My Love, The Long And Winding Road, When I’m 64, Let It Be, Helter Skelter, Eleanor Rigby, Live And Let Die have been recorded by some of the world’s greatest artists. The Art of McCartney will be released on November 18th. There are so many great interpretations here but look out for Willie Nelson’s heartfelt Yesterday, Roger Daltrey’s frenzied version of Helter Skelter, B.B. King’s atmospheric On The Way and The Cure’s Hello Goodbye . Also Smokey Robinson who makes his version of So Bad from Paul’s Pipes of Peace album his own, his tender vocals taking the song in a new direction. All aspects of Paul ’ s peerless back catalogue have been explored from The Beatles to his experimental early solo work, to Wings and his latter solo output. Lesser-known hidden classics such as Junk and Every Night are given a fresh outing and interpretation. 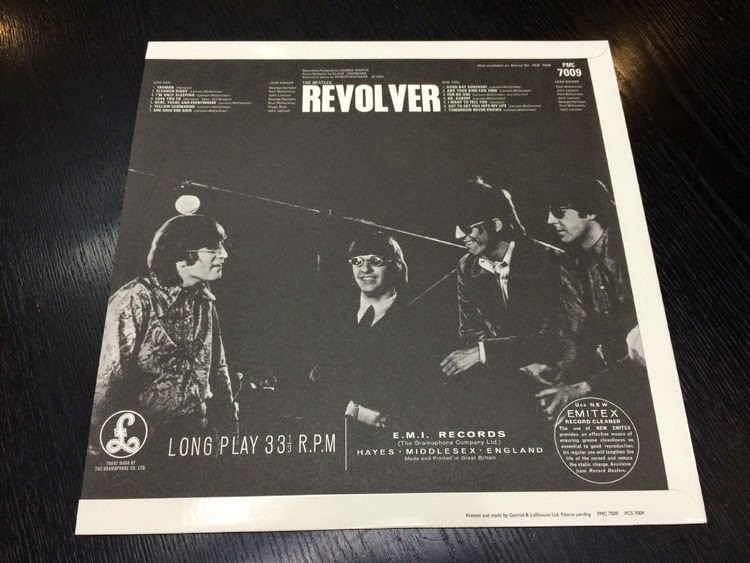 Original photo for the Revolver back cover. © Copyright Robert Whitaker. The Beatles in Mono is out, and I had the privilege of attending a small launch party at the appropriately named Mono Café in Oslo on Sunday to have a look and listen to the new pressings. What was apparent about the new editions was that even though they had gone to great lengths of reproducing the original packaging, there are some tell-tale signs which makes one able to ditinguish an original from a reissued mono album. 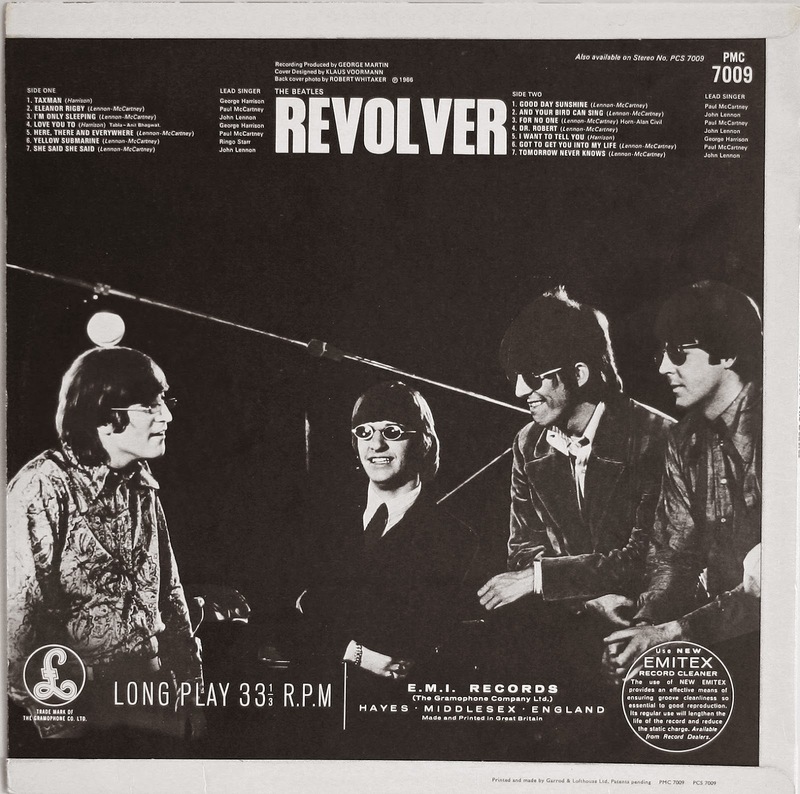 One of which, surprisingly, was that the back cover of Revolver was considerably darker than it used to be on the old Ernest J Day and Garrod & Lofthouse covers. Of course, even back then, the full clarity of the original photo (depicted above) was not reproduced on the cover (below). You can clearly see where George's head ends and the dark background begins. This is more difficult on the new edition. 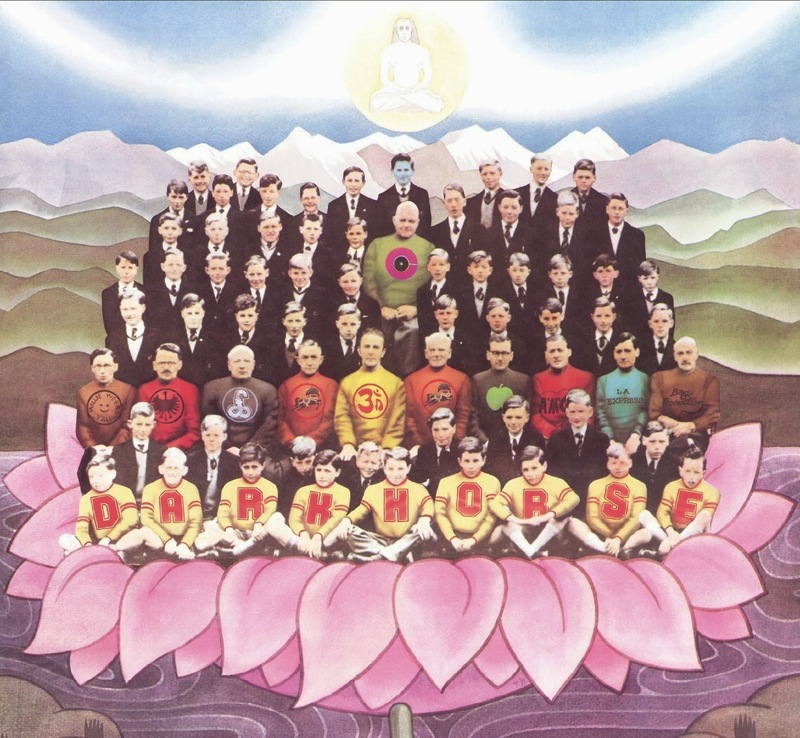 Of course, the quality of said photo has continued to deteriorate on subsequent reprints in the past, but I thought they would have taken more care to preserve the original quality on this particular reproduction of the album cover. The label is also easy to verify as a new edition. The new label omits the legend "Sold in U.K. Subject to resale price conditions, see price lists" and features a new matrix number (XEX 605 is now LCO1846). Also, below the record number (in this case PMC 7009) on the right is a new Apple Records catalogue number (in this case 509993380415). This is all very well, because I'd like to be able to distinguish between an oldie and a newie. For the sake of comparison, here's the label from the 1982 mono albums re-release. The 1982 mono label also omitted the "Sold in U.K." text, but kept the original matrix number, since they used the old stampers. For the vinyl itself, the weight is a giveaway. I had the opportunity to weigh an original "A Hard Day's Night", and it weighed in at 149 grams. The new edition of the same record clocked up an impressive 194 grams. Of course, if you bring a scale to the record fair it's very likely you'll be branded an idiot. As for the sound, his was a little more difficult to compare in a noisy club, but I did think that the EQ has been adjusted a tad, I thought I heard more presence in the bass department on the new pressings. 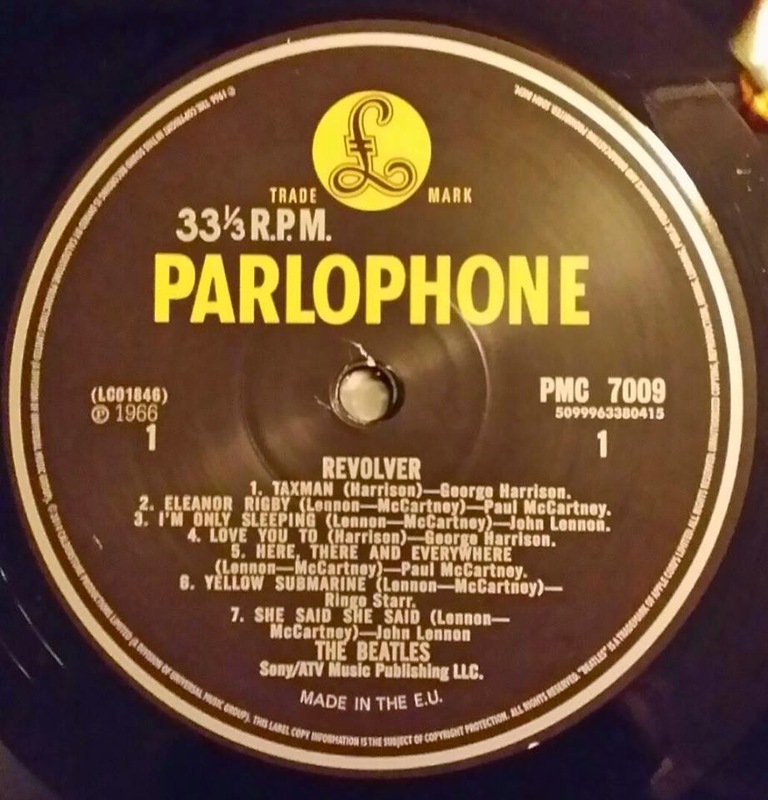 And for the record, "Tomorrow Never Knows" is RM8 and not the much rarer RM11, which was placed by mistake on the very first pressing of "Revolver". Meanwhile, you can listen for yourself on the new official site. Paul McCartney 'Early Days' Exclusive Behind-The-Scenes Jamming - Full Version.